Saturday we get a normal New England snowfall–and not a big one. The snow starts around midnight and continues through Saturday. If duration alone counted this would be a monster. Luckily, this storm will be many hours of mainly light snow. In the movie “Under Seige 2: Dark Territory” terrorists grab a transcontinental passenger train. On board, Casey Ryback (Steven Segal). Of course Ryack is not rounded up by the terrorists, but his niece (played by a young Katherine Heigl) is. As the terrorist leader discovers her connection to their nemesis, she pulls a cannister of mace from her pocket and sprays it in his face. Penn: Not mace, sweetheart. Pepper spray. Sold to civilians. Penn: …it just clears the sinuses! We are pretty much at the same point with snow. After last week’s blizzard, a normal snowfall just clears the sinuses. The snow starts around midnight Friday night and continues through Saturday. If duration alone counted this would be a monster. Luckily, this storm will be many hours of mainly light snow. The European model data available to me has three hour resolution and one inch threshold for snow. In none of these three hour windows does Connecticut reach an inch of snow. But, as I said, this is a long duration event. The snow exits after dark. We could see twenty hours of the white stuff! As the storm moves into the Atlantic it will ‘bomb’. By then it will be far east of us. We’ll get little of that fury, though snowfall numbers toward the Rhode Island border will be enhanced. 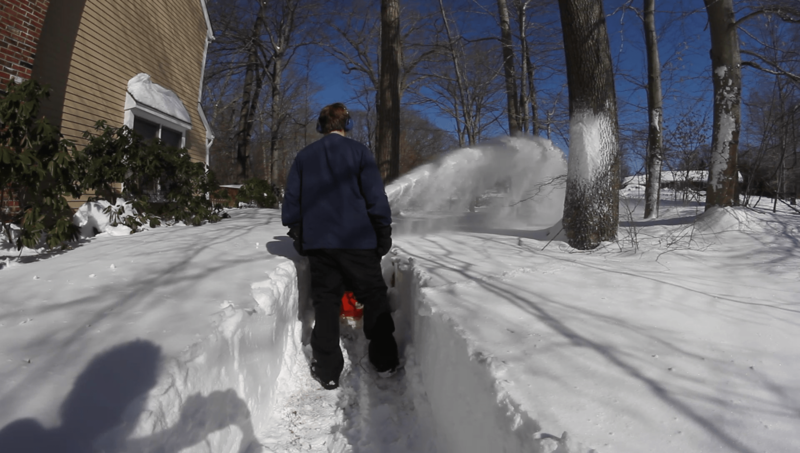 Most of Connecticut will get 2-4″ of snow, with a little less in Fairfield County and a few inches more near I-395. I’ll keep watching the HRRR, the high resolution, short time frame model Our storm encounter is starting to move into its domain. The HRRR does show some heavier snow just west of us late Friday evening. If that trend continues I’ll update this entry. Right about now there are lots of Connecticut residents suffering cabin fever. When they bolt the house on their day off they’ll face slippery roads and slow traffic. We shouldn’t have road closures or massive power outages this weekend. Remember, all the slippery is in the first &#188 inch. Stay safe. Milk and bread will still be available Sunday. Yes, if I ever adopt a dog, it will be from the shelter. But going to dog shows gets me my ‘pet a dog’ fix for a short time. Give Doppler a skritch and a cookie. Your shadow in the lower left reminds me of something Alfred Hitchcock would do in his movies. OK, so this morning the guy on WTNH (sorry, I put it on before GMA) said “don’t cancel your Saturday plans”….so, I told my daughter that we would visit her at college in Poughkeepsie (she is “desperate” for groceries). Are you telling me that’s a bad plan? Is Sunday better or worse? Help!! Laura – Honest, I didn’t hold back. Only you can make those decisions. Geoff could you tell us a bit about what happended with that meteorite ? Should we be worried ??? Ummm….so I should play it by ear, huh? Laura – I apologize, because I give this answer all the time. I don’t know your driving skill, your car’s model or condition, the roads you take. There is no way I could ever give you a learned answer. And, if I did, I become partially responsible if you get into an accident. Even in good weather I never say whether someone can go or not. No problem, we’ll figure it out tomorrow when we wake up, I guess. By the way, I84 makes me crazy when it’s dry so I’d probably hate it snowy.